On September 31, the Standing Committee of China’s National People’s Congress issued strict procedures for the election in 2017 of Hong Kong’s next chief executive. The NPC proposal essentially gave China’s central government the right to decide who could and could not stand as a candidate for Hong Kong’s top office. 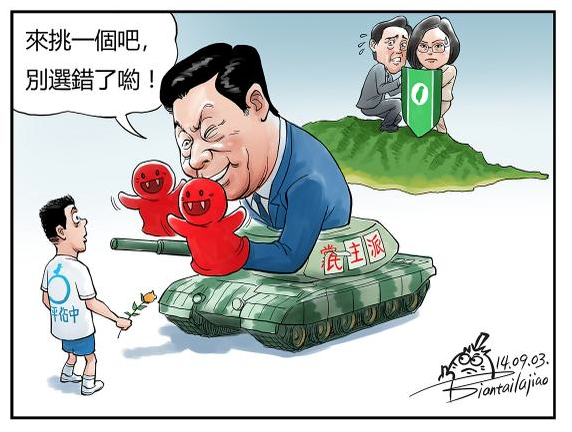 Quoted in the New York Times, veteran Democratic Party politician Cheung Man-kwong, said: “By endorsing this framework, China has in truth and in substance reneged on her promise to give Hong Kong universal suffrage.” In the above cartoon, posted by Perverted Pepper to Twitter, President Xi Jinping, in a tank that has haphazardly been relabelled “democratic party,” approaches a man labelled “Occupy Central.” Xi offers a choice between two red puppets, both with menacing teeth. In the background, an anxious Taiwan looks on. NextUnhealthy criticism of a failing health system?